Emily Getting гитара Lessons. Emily getting lessons for a Кости episodes. 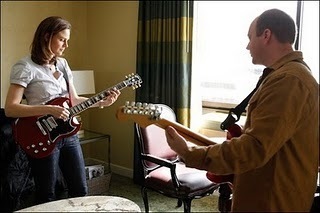 <i>For tonight's ep: Emily gets lessons from Кости Музыка Editor and GREAT guitarist Jeff Lingle. He's incredible. - Hart Hanson</i>. Wallpaper and background images in the Emily Deschanel club tagged: emily deschanel emily deschanel photo bones guitar lessons season 5 5x19 the rocker in the rinse cycle jeff lingle.